Led By Donkeys is the name of a group of four friends who describe themselves as an anti-Brexit guerrilla protest group. They came up with their idea last December, while discussing Brexit in a pub. They were talking about how tweets (in particular one of David Cameron's) can get lost amid the noise of the internet. They wondered: "Can we make sure it wasn't forgotten about?" Four months on, the group has hired more than 240 billboards across the UK, having raised over £340,000. The posters feature old tweets or quotes from politicians who have been involved in the Brexit process. Why choose billboards? Co-founder Adam - not his real name - believes endless scrolling through digital content has led to a "problem in holding politicians to account - they get away with saying things". "Very quickly these quotes disappear into the digital graveyard. We have put these tweets back into the public space. It gives people the opportunity to re-read them in the reality about what's unfolding." "In an information-rich, perhaps information-overloaded age, putting these words up without... commentary gives people an opportunity to appraise them on their own terms. "That's the space in which people can begin to change their own minds." There's another point, he added - not everyone who is politically engaged is on social media. "Taking [the words] off the digital, makes them more tangible. That move from digital into physical thing, the responsibility for the words becomes more acute." On the other side of the debate is Brexit Express, a pro-Leave group formed in the run up to the 2016 EU referendum. Its current campaign started a month ago, though not in response to Led By Donkeys, said Patrick Barrow. It has more than 100 ads up across the UK at the moment. "Its simple reasoning is to really ensure MPs are reminded of public opinion," he said. The idea the internet is king is true "up to a point [but] at some point most people are on the roads, on the street, in a Tube station." In that regard, physical posters can complement online campaigns, he said. Billboard ads are "more impactful" and "play much more to the tried and tested techniques of commercial and political slogans". He cites iconic slogans such as "Beanz meanz Heinz", adding: "These are things that people store in their heads." The 2017 film Three Billboards Outside Ebbing, Missouri, about a grieving mother who seeks justice for her murdered daughter by hiring billboards, sparked similar campaigns. Last year in London, Grenfell Tower campaigners drove banners in the same colours and font of those in the film through the capital. Other stunts - including one by NHS campaigners in Bristol - have also taken inspiration from the film. And separately, in March last year, huge signs promoted the Saudi crown prince ahead of his visit to London. Yvette Williams, from the Justice 4 Grenfell group which was behind their billboard effort, said organisers were looking for new ideas to draw attention - and, in particular, catch the eye of young people. The three signs achieved their aim. "Stormzy picked it up," she said, referring to the south London grime star who, during his Brits performance a week later, criticised Theresa May over the government's response to Grenfell. Image caption "Billboards still work," said Three Billboards Outside Ebbing, Missouri actress Frances McDormand, who said she enjoyed seeing them move "off the screen and onto the street"
Last summer, vegan Tony Galuidi, from Middlesbrough, spent £2,400 on four billboards near the town's traffic hotspots, to urge people to consider what they eat. Image caption Mr Galuidi said "the novelty" of buying a billboard is a "different way to get the message across"
According to Outsmart, the trade body for the billboard industry, the market for "out of home advertising" grew by 5.7% last year to be worth £1,209m. However, data suggests this growth is down to the boom in digital billboards. Traditional ad hoardings have seen a decline in revenue. 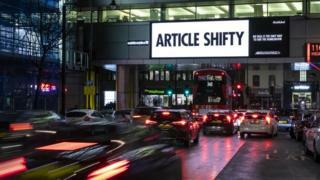 The market for billboards is showing "continued steady growth" said Martin Corke, of Clear Channel UK - part of one of the world's largest outdoor advertising firms. Globally, it sells space on hundreds of thousands of billboards. With 12,000 in the UK, national reach - "they are kind of everywhere" - is a big draw. But also, they are a "safe place". "Brands don't have to worry about appearing next to inappropriate content. You are in the public domain, it's a very open environment." By contrast, online ads risk appearing next to offensive content. An obvious perk for advertisers is that "the public can't miss them". Another is they represent good value, with rent for a two-week billboard starting from hundreds of pounds. Meanwhile, Simon Boon, director of billboard advertising company Airoutdoor - one of several which sold space to the group Led By Donkeys - said traditional billboard advertising "works beautifully" with online. "Although we spend a lot of time on a device, we are still driving our cars, walking to work." Mr Boon said the company is apolitical, but believes in freedom of speech. "We said we will do this as long as there's no politics and swearing," he said. "No obscenities, nothing which can be any way illegal or immoral. As long as it meets that criteria, we are happy to put it up." The Advertising Standards Authority said billboard ads must not be misleading, harmful or offensive. However, it said it does not regulate political ads, so when campaign groups buy billboard space it is likely to be considered political and falls out of its remit.